"These are not the hands of a killer." And they weren’t. Manicured to mechanical perfection, the nails polished immaculately, cut short at exactly two millimeters past the tip of the finger. Fingers that were slender, as far as male fingers can be. The wrinkles at the joints stood out, the only ones of their kind to be found on these hands. The skin itself was pale but smooth, like silk. Golden lines occasionally sparked underneath it like archaically patterned circuitry, as if to accentuate his choice of words. As he toyed absent-mindedly with the object he was holding, glimpses of his palms revealed that they too were soft, betraying a life free of the coarser obligations. He spoke again. "Yet, we both know that I am. I have seen lives ended at the hands of enraged cattle, good people’s shells stripped apart by inelegant tools of destruction. I have in turn killed this cattle, throwing their lifeless husks to the hungry void. I have fought enemies sheltered by walls they thought would keep them safe. I have imagined their screams in my mind. My lasers danced across their unshielded armor-stripped hulls exposing empty interiors to space and I smiled as they died." "This is what you’ll face. Madmen locked inside capsules, squandering lives as if they were nothing. When you are up there you are a tool, nothing more. A slave to the will of a pilot, bound to a man immortal until his mind can no longer be cloned." "Mankind has taken to the stars and destruction has followed in its wake. Demigods patrol the lifeless expanse above, and they don’t care about you. We are pilots. We control your destiny. When you are gone, we will live and we know this." "These are not the hands of a killer," he said, looking squarely into the eyes of the young man across from him, "but this is the face of one." "Think carefully before you answer. If you decide to rise above your world and begin life among the stars, you will be nothing. You will be a drone in the hive of an insane Queen, existing solely to provide the ship with needs, links in a chain too complicated for you to understand. You will live this ungrateful life until the day you too will be floating, frozen, between distant suns." The words were true, Daren knew that much. But his long-standing dream, of rising through the ranks aboard a battleship-class vessel - perhaps making it to Engineer, or even Chief Engineer - was all-consuming. He could not resist. The workers at the ground-docks had pointed him to a capsule-cleared pilot only after three months of harsh, unremitting labour. A conspiracy of fate and hard work had permitted him to meet with this Amarrian, who had needed but a brief look at him to know his aspirations. Taking a deep breath, Daren nodded and spoke the words that would condemn him: "I understand." 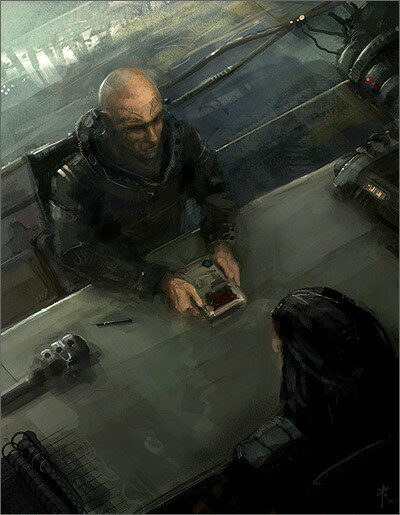 In a fluid gesture, the pilot across from him slid the datapad he was holding across the table. "Press your thumb on the pad and slide your IDImplant over the dotted line. Transfer will be booked. Keep the pad with you, it’s your pass to my docks. Report to the quartermaster there; he will roster you in, arrange a bunk for you and explain to you your duties. Work hard and you’ll be rewarded. There’s no place for slackers on my decks." "Now, if you’ll excuse me, I have business deals to conclude." Nodding his agreement, the young man left the table. Stunned, he made his way out of the establishment, holding the datapad tightly, as if his life depended on it. Four months later, Daren Athaksis was confirmed as one of six-thousand three-hundred and fourteen reported casualties resulting from the destruction of the Apocalypse-class battleship "Dam-Imud." His post was filled within three days. His family was not notified.